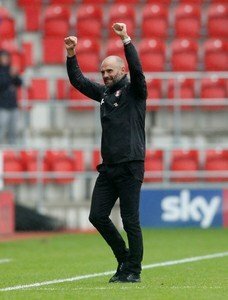 Rotherham United Manager Paul Warne could not have been any prouder of the way his lads battled to the end to get a point against a very good Sheffield United side this afternoon in front of the television cameras. Speaking to iFOLLOW after twice coming from behind to get a two-all draw the Millers Boss said, ‘I was really proud of the performance and we went toe-to-toe with one of the best teams in the league. The lads never gave up. Going one down after having all the play might have sent the heads down a little but it didn’t last and we tried ALL game. I hadn’t actually thought skipper Vaulks had had one of his better games today but Warney is right and that clearance probably did turn the game – had that gone in, well, it could have opened the gate to a lot more going in. But they didn’t and we stood tall. It was a good performance and you can’t ask any more than for the players to come from behind not once, but twice. The Sheffield United fans were shouting about being top of the league with minutes to go – well, they might have gone second but for a goal from substitute Jamie Proctor. Sheffield United Manager Chris Wilder said that he thought his sides performance was ‘very, very poor’ and said that if he’d been in the Millers dressing room after the game he’d have been disappointed not to get all three points.